Seemingly each day new stories of hacking and digital data breaches are cropping up in headlines, leaving business owners scrambling to find solutions to protect against electronic threats. But despite these new security challenges business leaders are now grappling with, experts continue to stress how important maintaining hard-copy document security is. A stolen paper document with confidential information can be just as disastrous for companies as digital documents, however with the help of security strategies like document shredding, businesses are able to find effective solutions for upping their data breach defenses. Here, you can find a range of helpful information on how shredding can prevent data breaches, with resources including an in-depth white paper (available for .PDF download) as well as supplementary articles, infographics, and related videos. Learn more about how shredding policies help to keep sensitive information secure throughout its lifecycle with the help of the related information and resources below. While document shredding is one of the most powerful tools at a business’s disposal for protecting against data breaches, the protection shredding provides truly depends to how often you shred, what you shred, and how you shred it. Throughout this in-depth white paper, we take a closer look at how companies of all shapes and sizes can use shredding and implement various document destruction policies to create sound data breach prevention plans and help protect their sensitive documents from being used against them. Interested in learning more about using shredding to defend against data breaches? Check out these articles, videos, infographics, and more! As the number of data breaches continues to rise each year, it’s imperative that companies start taking preventative actions. There are a variety of strategies to decrease the threat of a data breach, here we discuss how shredding can help keep your organization safe and provide an infographic outlining 4 key steps. Many small businesses are at greater risk for a security breach as well as at risk to have their information stolen. Small business cannot compete with large corporations so they decide to cut costs and do not employ a destruction service or even train employees on the importance of information security. learn more about how your small business can change and begin protecting its personal information of the business, employees and the customers. Although security experts continue to stress the importance of maintaining hard-copy document security along with new protections for digital data breaches, many companies unfortunately still learn this lesson the hard way. This case study looks at just how much damage data breaches can do, and provides strategies and services businesses can implement to avoid similar disasters. 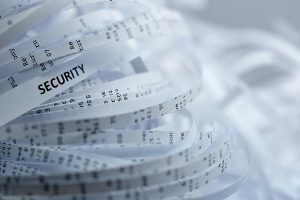 The increasing costs and overall impact of data breaches can pose a serious threat to businesses in the long term, but with the help of secure shredding services ranging from mobile to off site shredding, businesses can create document destruction practices and policies to keep their sensitive information secure. To get free shredding quotes from local providers near your office or learn more about any of our available services, just give us a call today at (800) 747-3365, or simply fill out the form on the right.